There really is only one answer: The Food. We are driven by a desire to make the best Traditional American BBQ that you have ever had, provide customer service that has no equal, and to be held as the standard by which you judge all other BBQ joints. INCLUDES: Pulled Pork, Brisket, and 3 sides, for up to 60 people. *Additional charges apply for groups over 60 and menu substitutions. Casual and easy...we set up your food and go! Perfect for weddings, and more "formal" occasions. Attendants will refresh the trays of food and answer any questions your guests may have. Hard to find good food where you work? Bring us to your corporate park for lunch service! Want us at your... (festival, concert, breweries, etc...)? Interested in having us cater your next event? Please fill out our contact form and we will get back to you with a quote! We need your address of the event to ensure travel time and/or parking. For truck service, please ensure you have a 45-foot area to accommodate the trailer and truck. Please let us know if there are any small bridges and or height restrictions on the way to your home. Please note: any event located outside a 20-mile radius is subject to a travel fee. Corporate Park Lunch Service-this means you want us to set up and sell for a 3 hour lunch period. *** Please include contact info (Name, Phone Number, and Email) of the property manager in the comments section. Please note; We arrive 3 hours prior to service time to set up and prep. Standard truck service time is 3 hours. $250 for each additional hour. This number must be given to ensure an accurate quote. Have a crew of big eaters? Do you have people who think catering is an all you can eat buffet? Do you know that EVERYONE loves a certain meat or side? Please leave us a comment on what you would like to order more of and we will include that in our quote. Do you need chaffers and fuel? We have got it covered. We don't need anything! I was at a party you catered and it was so good I couldn't wait to book you! Thank you! We will contact you as soon as possible. Please allow a few days to process your request. PLEASE NOTE THAT A NON-refundable DEPOSIT AND CONTRACT MUST BE COMPLETED BEFORE YOUR DATE IS SECURED. NO EXCEPTIONS!!! due to the nature of the food truck business, our schedule is not only weather and parking dependent, but it can change at any time. It is for that reason we ask that you look at facebook or Instagram for our most current schedule. We apologize to those who do not engage in social media, but it is the quickest and most effective way to get our schedule out. Carroll County folks! C’mon out to see us. Don’t miss out! This is the food truck event of the year! Q: How much does it cost to bring the truck to a venue? A: Our starting price is $1500. This includes: a 3 hour service window, a basic menu of Pulled Pork, Brisket, Mac and Cheese, Baked Beans, and Coleslaw; enough food for up to 60 people. Q: Will you bring your truck out to an event with less than 75 people? A: Absolutely, for the starting price of $1500. Q: When I get catering, is it all you can eat? A: No, we price our catering by average portion size per person. If you have a group of big eaters, or would like more of one or two items, we can definitely work with you! Q: Do you do drop-off or pick up catering? A: Yes, we do drop off, but we need to evaluate on a case by case basis on what jobs we can accomodate. Q: Do you provide a catering contract for catering events? A: Yes, we do. All catering jobs will have a contract attached to it. Q: How far will you travel for catering? A: We take catering jobs on a case by case basis. Any job outside of a 20 mile radius will have a travel fee attached to it. Q: Why do you have such a limited menu on the truck? 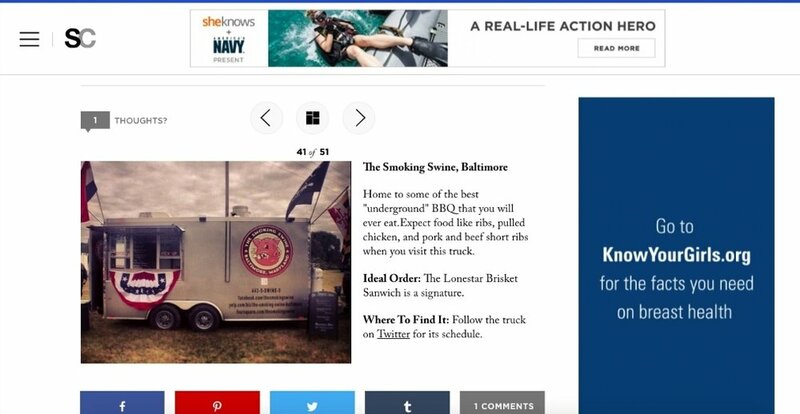 A: Well, first of all, we are a food truck, so size is a consideration for everything we do. Secondly, when was the last time you went to a restaurant with a HUGE menu where everything was made exceptionally well?! We keep our menu small so we can focus on quality over quantity. Q: "What's the difference between this sandwich and that sandwich?" A: For the love of god, please read the menu descriptions!!! Q: Do you accomodate vegan or vegetarian requests? A: We have existing menu items that are vegetarian (Mac and Cheese, Cucumber Salad, and Coleslaw). Vegan...Absolutely NOT. Nothing against our vegan friends, but the way we prepare our items in our day to day operations does not lend itself to the strict standards of food preparation that vegan food requires (we don't want to cook your BBQ'd jackfruit sandwich on a gluten free bun on the same grill we just cooked 10 lbs of bacon on). Q: "I have a latex allergy. Do you use latex gloves when cooking?" A: No. We use Nitrile gloves so those with latex allergies can still enjoy our food. Q: Why do you call your Mac and Cheese, "Slap Yo Mama Mac and Cheese"? A: No, of course we don't advocate seriously slapping your mother..."The origin of this phrase traces its roots to the southern states of the U.S. When first coined it meant someone had just tasted something so delectable it caused them to be angry towards their mother for never creating food equally as tasty... angry enough to slap her." It really is that good! So calm down...It's a good thing!!!! Q: HOW CAN I GET YOU TO COME TO MY (office, building, etc...)!!?? A: We need the following info...What county are you located in? What is the contact info of the management company that owns your building? Approximately how many people are in your building? We are ALWAYS open to going to new places, so send it to info@thesmokingswine.com, and we will try our best to get there! Q: We want your truck at our event!? How big is the truck? A: We have a 42' trailer and truck. Client must verify that we are allowed to park at the event location site. If, for any reason, The Smoking Swine is unable to park at the event, all monies, and product for the event, in full, will be retained by The Smoking Swine. A: We use a Cookshack on the truck and a Lang and Southern Pride for larger events. Q: Do you serve alcohol on your truck? A: At this time we do not...please don't ask anyway. Q: How was it working with Guy Fieri on Diners, Drive-Ins, and Dives? Messlords! Navel Station Great Lakes. Nothing like feeding 3500 graduating recruits!